Events from the year 1826 in France. 15 January - The newspaper Le Figaro begins publication in Paris, initially as a weekly. 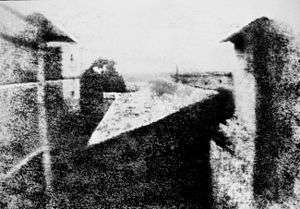 June - Photography: Nicéphore Niépce makes a true photograph, View from the Window at Le Gras. The Hachette publishing business in Paris is established by Louis Christophe François Hachette. The second novel by Victor Hugo, Bug-Jargal, is published. 6 April - Gustave Moreau, painter (died 1898). 5 May - Eugénie de Montijo, wife of Napoléon III (died 1920). 18 May - Emile-Justin Menier, pharmaceutical manufacturer, chocolatier, and politician (died 1881). 29 June - Charles Ernest Beulé, archaeologist and politician (died 1874). 24 October - Léopold Victor Delisle, bibliophile and historian (died 1910). Louis Arsene Delaunay, actor (died 1903). 3 January - Louis Gabriel Suchet, Marshal of France (born 1770). 2 February - Jean Anthelme Brillat-Savarin, lawyer, politician, epicure and gastronome (born 1755). 8 October - Marie-Guillemine Benoist, painter (born 1768). 5 November - Élie Halévy (Chalfan), Hebrew poet and author (born 1760). Henri-Cardin-Jean-Baptiste d'Aguesseau, politician (born 1746). Jean-Baptiste Stouf, sculptor (born 1742).